Can't help but smile when I see this 'Either Gender' diaper cake. The colors are bright and fun and all the embellishments make it perfect for a boy or a girl! So cute! Laura has submitted her great diaper cake ideas, complete with photos and instructions below. Laura is another one of our excellent readers who is helping the rest of us gain inspiration and ideas to make our own diaper cake. Thanks Laura for sharing your cute cake and helpful instructions! 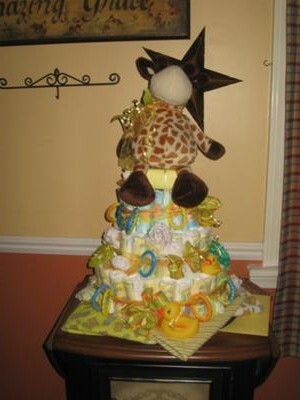 This diaper cake was so much fun to make!!!!!!!!!! I made the cake in a neutral color because we didn't know the gender of the baby.I looked for things to work with the color theme. 175 new born diapers rolled and taped closed. there is 3 receiving blankets folded flat for the bottom of the cake. Those were set on a plastic tray. for the inside of each layer i used big bottles of baby lotion shampoo baby powder desatine. I set my center with 3 bottles of baby product taped them together with clear packing tape then worked a circle of diapers around the bottles then i used curling ribbon to tie around each circle of diapers until i had the right dimension of the cake. then continue on the next layer not as may diapers but around baby bottled items. In the second layer i put in between the diapers baby shirts white. continued on tho the third layer in the same manor. I used baby wash clothes to curl and place in cake like roses. I also did the same with little sock hats for the baby. Each laker has the curled ribbon around the layer then I put wide ribbon around each layer and made some bows to angle up the cake. I tucked a comb a brush,a spall container of cue tips rapped like a package with a little bow on it hen tucked it in the side of the cake. I used teathers ,rattles and rubber ducks to decorate and i found chains that connect to each other pulled the colors i wanted and spaced them around the cake. On the last tear I used a bottle brush to and put it in the center to anchor the stuffed animal. Then wrapped a box of baby bottle liners to look like a package and set my giraffe on it and secured it with curl ribbon and made a big bow with the wide ribbon I uses around the cake.